With the holidays upon us, we can all expect a few extra visitors in the coming days and weeks. From babies to toddlers, tweens to teens, parents to grandparents – the influx of visitors can be varied and unpredictable. And while we may find this revolving door of family and friends fun and festive, the experience can cause angst and anxiety for our pets. Here are some tips to keep everyone (humans and pets) safe and sound during this social season. As tempting as it may be, now is not the time to skip your pooch’s morning walk or evening game of fetch. With so much sudden change and uncertainty, it’s more important than ever to stick to your dog’s regular routine. There are a variety of reasons why you should have a “time out” space for your pooch. Fearful visitors, over-stimulation, and unpredictable kids can create uncomfortable and sometimes dangerous encounters. Additionally, the allure of crinkly scraps of wrapping paper, toy parts and food scraps can also entice your pet into a troublesome situation. Whether you use a crate, a bedroom, or a cozy space in the laundry room, make sure you carve out a comfortable space where your dog can escape, relax, and recharge. Provide water, a puzzle, toy, bone, or other chew toy to keep your pooch occupied and to burn off a little nervous energy. Do not assume your dog will be comfortable with small children, especially if your pooch is not used to them. Toddlers can be particularly unsettling to dogs. Their faces are often at a dog’s eye level, their gait can be wobbly and unpredictable, and they are not old enough to understand the proper way to approach, touch, or play with a dog. To put it simply – do not leave your dog alone with unfamiliar children. Look for signs that your dog is stressed such as growling, ears pinned back, tail between legs, or snarling. Quickly remove your dog from any situation that appears stressful. Be clear in your communications if you don’t want guests to feed your dog scraps from the table. Providing treats for your guests to give your dog can solve multiple problems. 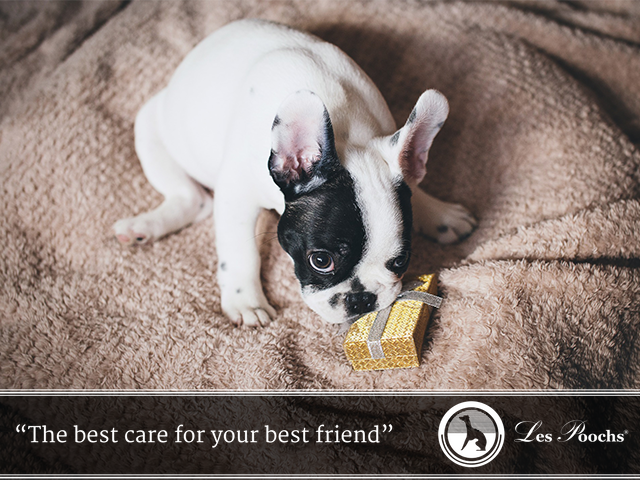 First, treats can help build a positive relationship between your guest and your pet. Second, having treats available will appease that well-meaning guest who really, really wants to give your dog just a little piece of cookie, cheese, chicken, etc. Your sweet dog provides you with the perfect excuse to escape the hubbub for a quick walk. This will give your dog some much needed fresh air and give you another thing to love about your pooch.